A sport for people with additional needs is in need of additional funding. 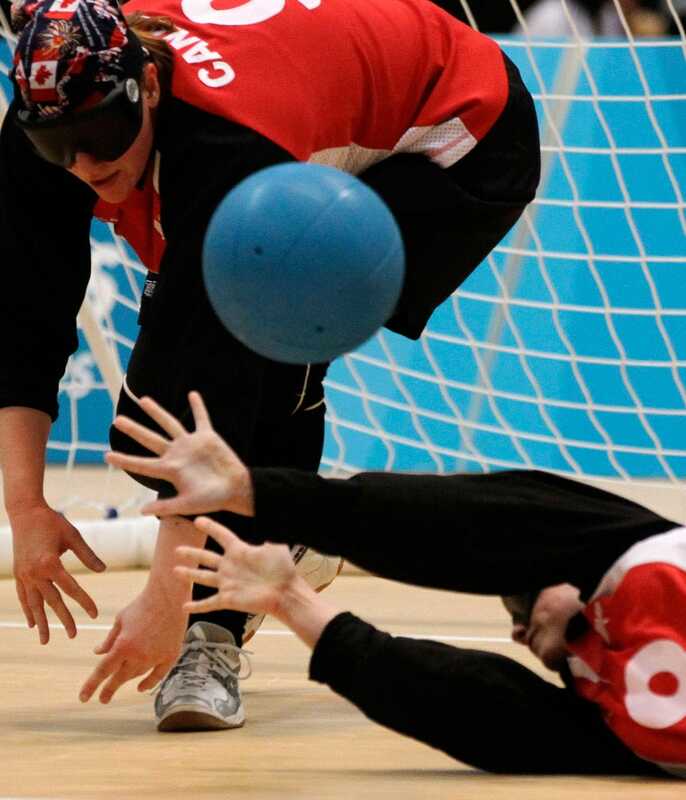 Goalball, a unique mix of soccer and basketball for visually impaired competitors, is expected to be one of the more popular events at the Toronto Parapan Am Games from Aug. 7 to 15. That exposure is likely to boost the sport at the grassroots level for the game that seems to be outgrowing its financial support. The nets span the baseline of an average basketball court. Teams of three alternate between hurling and saving the ball. The ball has the density of a light medicine ball with the addition of bells on the inside to aid in tracking it. Players are in constant communication with each other, letting teammates know where to defend or attack. “You need to be aware of where your players are on the court and where the other players are, where the ball is going,” says Simon Richard, a veteran of the national goalball program. They reset themselves by taking a page out of legendary NHL goalie Patrick Roy’s repertoire by touching the goal posts to reorient to the court. Each shot on goal comes is fired at high speed. Offensive strategy is a mix of precision and power as each team tries to put the ball through the defenders. On defence, the players look to cut down the angles like goaltenders in hockey or soccer. Imagine doing this all without being able to see a thing. Each player wears vision-blocking goggles to level the playing field for athletes of all visual abilities. Who can play is an important part of any parasport. This holds especially true in games for people with visual impairments, as it encompasses a wide spectrum. “Anybody can play goalball, whether you have sight like me, sight like Simon, sight like Oliver, there’s different categories,” says Parsons. Parsons has Stargardt’s disease, a macular degeneration that he has had since he was 12. Richard has aniridia, which means he does not have irises. Pye has retinitis pigmentosa, a disease that slowly depletes the healthy cells in the retina. You have to legally blind to play in international competition, but non-blind athletes are eligible to play in other matches. Canadians are among the top goalball players in the world. The Maritimes, particularly Nova Scotia, has a rapidly growing scene, with Halifax’s Jillian MacSween getting named to the women’s Parapan Am Games team. Richard of Dieppe, N.B., gives the men’s team East Coast representation as well. Sliding across the old parquet floor of the George Dixon Centre in Halifax’s North End, the regional goalball senior and junior teams meet every weekend. Richard, Peter Parsons, and Oliver Pye are in their fourth season of competing together, and form the core group on the men’s national team program. Parsons, an orientation and mobility specialist, has been playing goalball since moving to Halifax in 2005. “After getting into my first tournament, I was hooked,” he said. Richard is the youngest of the group, but has medals from the national junior circuit and recently made the senior men’s team. The 20-year old student at the University of Moncton commutes from New Brunswick to Halifax to compete regularly. Blind Sports Nova Scotia receives $2,500 a year from the Nova Scotia government’s Department of Health and Wellness. The team also receives funding from ENGAGE Interactive and the Canadian Blind Sports Association. “We have to fundraise most of our money because we go to three tournaments a year,” said Parsons. “You’ll see us at Sobeys or Walmart selling tickets a lot of times too,” Parsons says. They also have a “Dine in the dark” night each November to raise money. In its 2015 budget, Ottawa committed to invest $500 million in the 2015 Pan Am and Parapan Am games in Toronto in 2015. The government has promised ongoing funding for various targeted sports through Own the Podium as well as other initiatives – including $5 million specifically for the Paralympic Committee – that could trickle down to help goalball. But in order to see most of this investment, the goalball team needs to qualify for the 2016 Rio Paralympics. A gold medal at the Parapan Ams would secure a berth. If they don’t, this invested money will not meet the program’s development costs. Even if they do qualify, travel expenses will eat up most of this funding. Many of their tournaments are outside the province. Some are outside the country. Equipment costs are another financial burden. The teams currently practice using nets without netting and many bring their own padded shorts as well as knee and elbow pads from home. The balls cost $90 and have to be replaced regularly. Richard has been fully immersed in the sport since he was young. Richard is a product of the youth development system in Nova Scotia as well as his native New Brunswick. He began competing when he was 10, as opposed to his teammates who both began in their late twenties. Last year, Blind Sports Nova Scotia started a junior program in the province, and saw the girls’ team make it to the junior national tournament. The game is growing within the province, and these athletes are making an impact nationally. Coach Linda MacRae Triff runs practices for all of the organization’s goalball teams. She puts the senior men’s team through a cardio drill during the first half of practice and follows it up with either a scrimmage or other drills such as shootout practice or accuracy drills. If a penalty is called, the teams go one-on-one for the penalty shot. The defender must cover the entire net while the shooter must outsmart the goalie to capitalize. When working with the junior teams, specifically newcomers, MacRae Triff starts them off with the basics of throwing and defence, followed by passing and defending live shots. The players are constantly diving onto the floor to make saves. As well, constant body blows from the ball take a toll on both teams, especially as the game wears down to the final moments. In addition to the beating taken, the players must then get up and try to score using a variety of shots before the 10-second shot clock expires. Skip shots, high bounces and even spin shots are used. However, he wryly adds that he’s “just trying to look cool for sure,” a quip that draws smiles from his longtime teammates.